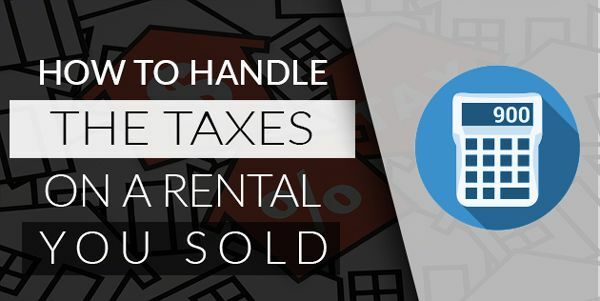 Though handling the taxes on your former rental property will probably be your least favorite part of the selling process, it’s absolutely necessary. Tax information is more complicated than stereo instructions in a different language. When you know how to read between the lines, it becomes a little easier to turn the mountain of taxes into a molehill. Below we’re going to provide you with some general guidelines to abide by when handling the taxes on your rental property. There’s two sides of the coin, and you can only be on one of them. There’s reductions in basis, the fancy term for losses, and increases in basis, the fancy term for gains. You probably already know whether you took a hit or came up big, but in order to properly crunch the numbers, you need to know exactly where you're at. Gains work very differently from losses. You’ll still need to pull the same figures, but you’re going to use them differently. Start by gathering all of your documentation. You have to be able to prove the numbers you're reporting are accurate. Staying organized is super important. You’ll need the paperwork that shows how much you paid for the house, and how much you sold it for. You’ll also need receipts relating to materials and services you used to repair or renovate the property. Your concrete figures should be based off of these numbers to show what you’ve truly lost or gained. Selling a rental property is different from selling a personal property, because a rental is a business venture. You’re going to be paying higher rates than you would in a personal sale, and there’s no workaround. What you’re paying is called a Capital Gains Tax, and it works much differently from normal taxes. Most of the time, it's easy to see what you’d pay in capital gains once you’ve worked your numbers. When you’ve claimed depreciation, the game changes. If you’ve claimed depreciation against your property in the past, it may come back to bite you now. Say you purchased your property for $200,000 and you were able to sell it for $275,000. That looks like a $75,000 gain on paper. If things weren’t always so great and you had to deduct a total of $15,000 in depreciation over the course of time that you owned the property, you have to add the depreciation you claimed to your gains. Instead of paying in on $75,000, your gains will be based on $90,000. To prove a loss, you’ll need to have all of the same figures together, including any depreciation you’ve claimed. Losses are awful, and the IRS knows that. It’s easy to work through losses, and there are some tax codes in place to help you – with a few exceptions. If you bought the property through a 1031 escrow, the tax basis may be affected by your previous property. You need to be sure that you haven’t technically acquired a gain. Another exception is a personal property you bought and later decided to use as a rental property. You’ll still have a loss to deduct, but it’s a different kind of loss. It's limited to the price you purchased the property for, minus the price you sold it for. Since it started as a personal property, any improvements may not count as business expenses. If the property was bought from scratch solely to be used as a rental, this is where you call your loss a Section 1231 loss. This would be very advantageous for you, because depending on how large your loss is, you may be able to keep the loss for as long as 20 years. If your loss is severe enough to be considered a net operating loss, meaning that it’s so great that it can cancel out all of your other income, you’re going to get a serious break to get yourself back on your feet. A 1231 loss may also allow you to revise previous returns to get back taxes you’ve paid years previous. Do You Want To Buy More Property? If you're only burned out on one particular property, you might be considering investing in a new property. The 1031 code will allow you to avoid paying taxes on a gain, provided you go through the correct process of reinvesting into a similar property. There's only one right way to do it, and it's a little complicated. You're going to need the help of a tax professional or a lawyer during the sale of your former property. Your gains will need to go directly into an escrow account, and they have to go solely towards the purchase of a new property. You have 45 days to complete that transaction, or else you'll have to pay taxes on your gains anyway. If you want to keep receiving rental income without having to do the work, you can always purchase a new property through the 1031 exchange, and have someone else manage the property for you. You won't be profiting as much as you did managing it yourself, but if you aren't looking to get out of the game entirely, it's better than nothing. If you’re still uncomfortable with your knowledge of the process or unsure of how to interpret your data, you don’t have to rely on yourself. You’ll be better safe than sorry enlisting the help of a tax professional. Winging it is fine for most things, but that’s not a chance you’ll want to take when it comes to the IRS. There’s no shame in letting someone who knows better, do things the right way. « Previous Post Finding The Best Way To Sell Your Unwanted Rental Next Post » How to Sell A Home You’ve Inherited Fast!